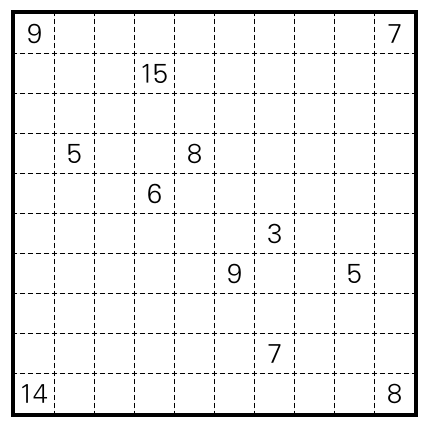 One of the non-standard puzzle types in the Serbian Grand Prix round is Shikaku with clues that are off by one (as “Shikaku Liars”). Here’s a practice puzzle. 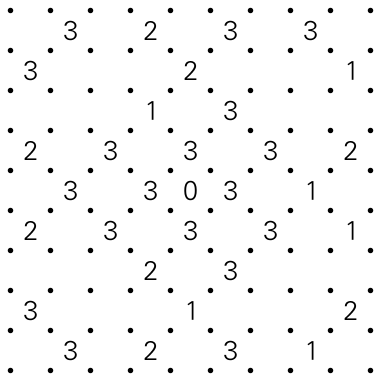 Rules Split the grid into rectangles composed of grid cells, containing one clue each, such that the size of each rectangle is equal to the corresponding clue ±1. Or see the instruction booklet. There’s another easier puzzle of this type on the Rätselportal: Knapp daneben – Rechtecke. Then, in the knapp daneben instance of the Hausigel Contest Series. The double-clue Shikakus on croco should also be good practice: 2014-03-01, 2014-04-04. This entry was posted in Puzzles and tagged knapp-daneben, practice, shikaku, variant on 2015-01-14 by rob. A Fractional Skyscrapers and a Checkered Fillomino on Grandmaster Puzzles. An Aquarium puzzle (Java applet, low resolution image here) for the Croco-Design-Wettbewerb. Speaking of which, I highly recommend lupo’s entry. This entry was posted in Puzzles on 2015-01-14 by rob.